Add a touch of sophistication to your morning coffee routine with this beautiful three piece set! Part of Mariposa's String of Pearls collection. Designed by Michael Updike. Handmade in Mexico of recycled sandcast aluminum. 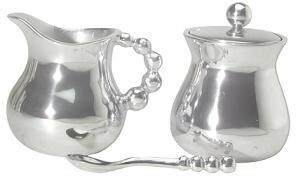 Dimensions: Sugar with Lid - 3" W x 4" L / Creamer - 3" W x 3.5" L / Spoon- 5" L.